Mommy's Kitchen - Recipes From my Texas Kitchen: S'mores Cookie Bars Oh My! 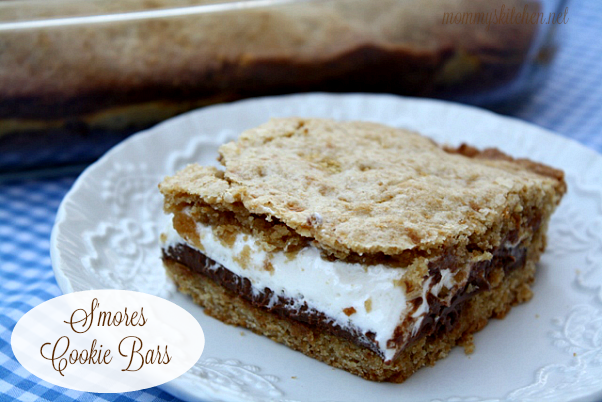 S'mores Cookie Bars Oh My! These S'mores Cookie Bars have all the flavors of traditional S'mores but in cookie form. These cookie bars are incredibly delicious and totally deadly. First off I want to say how excited I am to be back up and posting again. I hope all the issues that I've been having with my site are now behind me (fingers crossed). It's been a whole two weeks since my last recipe post. I think that is the longest I have gone since I started my blog, so please forgive me. Today I want to share a recipe for S'mores Cookie Bars. Let me tell you these cookie bars are delicious and deadly all rolled in one. They have a cookie dough bottom crust, topped with two king size Hershey's bars, marshmallow cream and a second layer of cookie dough.Whew these babies are defiantly not low calorie at all. 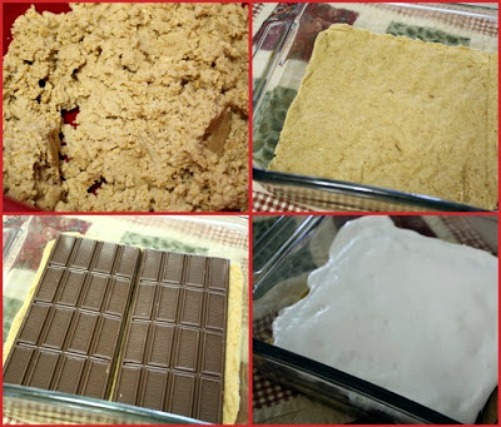 I have included some step by step photos of the s'mores cookie bars. In usual fashion the full recipe is at the end of this post. Grease an 8-inch square baking pan or you can line your pan with foil for easy removal and cutting. Use an electric mixer to cream together butter and both sugars until light and fluffy. Beat in egg and vanilla. Set aside. Whisk together flour, graham cracker crumbs, baking powder and salt. Slowly add flour mixture to the creamed butter mixture until combined. Divide dough in half and press half of dough into an even layer on the bottom of the prepared pan. Lay the chocolate bars over the dough. 2 king-sized Hershey’s bars fit perfectly side by side. Spread chocolate with marshmallow creme or fluff. Place dollops of it on the chocolate and spread evenly. Place remaining dough in a single layer on top of the fluff (you can roll the dough out between two pieces of waxed paper and use a spatula to place pieces of it on the top and pressed the pieces together). Bake for 30 to 35 minutes (I did mine a little longer to get that nice brown color), until lightly browned. Be sure to cool completely and then cut into bars. use regular Hershey's chocolate candy bars. Preheat the oven to 350 degrees. Grease an 8-inch square baking pan (I line my pan with foil for easy removal and cutting). Use an electric mixer to cream together butter and both sugars until light and fluffy. Beat in egg and vanilla. Set aside. Meanwhile, whisk together flour, graham cracker crumbs, baking powder and salt. Slowly add flour mixture to the creamed butter mixture until combined. Divide dough in half and press half of dough into an even layer on the bottom of the prepared pan. Place chocolate bars over dough. Spread chocolate with marshmallow creme or fluff. Place blobs of it on the chocolate and then spread it around. Place remaining dough in a single layer on top of the fluff (I rolled the dough out between two pieces of waxed paper and use a spatula to place pieces of it on the top and pressed the pieces together). Bake for 30 to 35 minutes (I did mine a little longer to get that nice brown color), until lightly browned. Be sure to cool completely before cutting into bars. Makes 16 squares. Cool completely before cutting into bars. Oh my gosh! I just doed and went to heaven. I wish I had one of those right now! Glad to see you're up and running again. You're blog looks adorable. Those look so good! I've been doing lots of S'Mores lately, not sure why, guess we just love them! I met Laura & Jamie at Baking with Betty! Great girls! Thanks so much for hosting! I'm not sure why I have a weird #39 in my title, but the link works! I am so glad to see your posting again. I am sorry about all the issues that you had. This recipe looks so good! It looks like a great kid friendly dessert. This looks like heaven. A must try! Love the new look! The cookie bars looks really rich and delicious! My kids would fall for this too! Wow those look super yummy!! Nice look over here too. Those bars look wonderful! Mmmm! Tina, I've bookmarked those bars, they look so so good. I love anything smore, I can't wait to make these. Thanks for hosting Potluck Sunday every week! I have made these before and they are as good as they look. Now I want to make some more. Love this whole precious post...the cookie bars and the picture of you and Laura and Jamie. It must have been so much fun to meet them! I made the delicious banana pudding from PD that you posted awhile back....soooooo yummy!!!! Yours look great Tina! Aren't these bars divine? I can't wait to hang with you again! I love what you did to your site too! This went right to my recipe file to make sometime! Mmm mmm mmm! Glad your blog is up and running, everything looks great! Yummy! I can't wait to try one...with a big glass of milk. Ohhh I love S'mores! Yay! These look wonderful! Love the tweaks to your site. It loads so much faster for me now! Looks great! Thank you for this fabulous recipe! I have a pan of them in the oven as I type - for the school bake sale tomorrow. Okay, my youngest would love these. She loves to make smores in the oven all the time. Love your blog! Just curious regarding the Smores Cookie bars. I cannot get the marshmallow creme where I am, do you think substituting marshmallows will work fine? Thanks! Thank you for publishing this recipe. I saw this in a magazine about a year ago and of course did not write it down. I was unable to relocate it anywhere. I doubled the recipe to make a 13 x 9 pan and took it to church. What a hit! Well. There goes my diet. Thanks alot haha. YUM! My husband and 2 boys are going camping in our backyard...what a great treat to have for them!!! Would love to try maling those very delicious looking bars..
Do I need 3/4 cups of graham crackers and 7 long sheets or does 7 long sheets make 3/4 cup?